Posted March 18, 2019 by Mitch Hitch & filed under City Hub. As the State Government pushes ahead with the controversial toll-road, despite community opposition, WestConnex is likely to become a lasting reminder of how good public transport was sidelined. With Western Sydney’s growing population there was no question that something had to be done to improve transport to and from the City. The State Government has repeatedly highlighted the issue of capacity on the Western Line as a major constraint in the 2012 Long Term Transport Master Plan and Sydney’s Rail Future plans. After rebranding CityRail to Sydney Trains in 2013, the State Government removed three train services in Western Sydney in the name of increasing capacity on the Western Line rail corridor. The cancellation of the City to Liverpool via Regents Park, City to Bankstown via Regents Park, and the direct non-special event Central to Olympic Park services had severe knock-on effects, including overcrowding at Lidcombe with a substantial increase in the number of commuter interchanges. While the changes to the Sydney Trains network might at first seem unconnected to WestConnex, a closer look into the State Government’s own State Significant Infrastructure report for WestConnex M4 Widening (2013) seems to suggest otherwise. 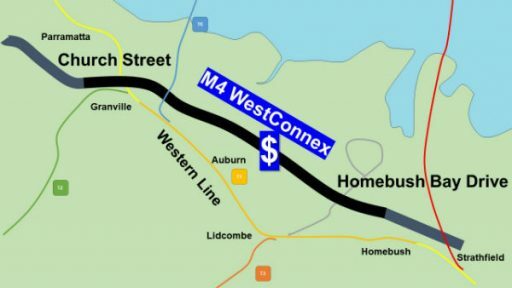 The statement indicating that “The following cumulative impacts may arise from WestConnex and staging” is followed by the astonishing admission that “service improvements on the Western Line over the concurrent time frame may result in increased patronage for trips in the M4 Motorway corridor”. Through intentional changes to the Sydney Trains timetable, the State Government has been watering down the efficiency of public transport in favour of toll roads. What is only slowly coming to light is that the government had considered building additional tracks for the Western Line rail corridor in mid-2013 before the release of the WestConnex State Significant Infrastructure Report. Consultations with rail planners had begun investigations into several options to upgrade the Western Line. One proposal was for an additional track pair from the Strathfield Junction near Homebush to be constructed to Granville, with different options for an underground section through Auburn station. Another was for a rail tunnel from Croydon to Granville, which was labelled an essential project in conjunction with the construction of the Sydenham to Bankstown Metro on the T3 Bankstown Line. The State Government’s Sydney Rail Future Implementation Plan – an internal Transport for NSW document published in 2013 – states that for Liverpool, Cabramatta, Warwick Farm and Casula, “customers are likely to experience journey times to CBD via [T2] South Line (without Croydon-Granville tunnel and running 20 trains per hour) of over 1 hour – c. 17 mins extra against today”. It also appears that the decision not to proceed with building additional tracks was taken in late 2013 as plans for an upgraded Flemington station in 2014 made no mention of including additional platforms or tracks along the corridor. Both options for additional tracks on the Western Line have been ruled out by the State Government despite a “Cabinet in Confidence” Rail Planning report indicating that the upgrades to the rail corridor were necessary to “meet the forecast passenger increase in 2036”. Tolls on the M4 were reintroduced less than three months before the Sydney Trains timetable changes of November 2017 which further removed express Western Line services from Lidcombe, Auburn, Clyde, Granville and Harris Park stations. On the day of the new timetable, Sydney Trains staff at Lidcombe station told commuters that the lack of track capacity had forced express Western Line trains to skip stations such as Lidcombe and Granville. The removal of train services for Lidcombe is compounded by its role as a major interchange for the T3 Bankstown Line and T7 Olympic Park Line. Granville is also a major interchange for Liverpool and Western Sydney commuters. Transport for NSW published its report in November 2018 into its “improvements to the Western Line” that occurred within the 2017 Timetable changes. This included a table showing the number of stations with increased journey times without the station names. After refusing to release the full breakdown of stations despite Minister Constance’s responses in Budget Estimate hearings indicating that such information was public, a Freedom of Information (GIPA) investigation has found a strong pattern of increased journey times for train commuters living near the government’s new infrastructure projects. It appears that express trains for Lidcombe, Auburn and Granville have been replaced with all-stations trains as WestConnex tolls were reintroduced/increase. Further investigation into the State Government’s approach to transport infrastructure planning has encountered difficulty with the WestConnex business case being off limits to Freedom of Information (GIPA) requests and Minister’s Constance refusal to answer questions about WestConnex being favoured over rail upgrades.